Rubber bracelets have been popular since the early 1980’s and they are still popular today. 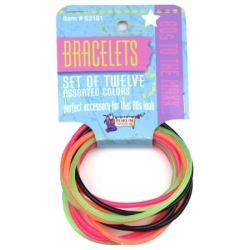 Each pack of rubber bracelets includes 12 bracelets, most in bright neon colors. These bracelets are perfect for completing any 80’s costume or for every day use as fun costume jewelry.